Starting your herb garden long before you can plant in the actual garden just makes sense. Even if it's still snowing and cold where you are, there are plenty of good reasons to start your garden journey. Just like a good Boy Scout, a good gardener's motto is: Be Prepared. That means being ready to start actually gardening before a seed hits the soil. You have stared at the magazines all winter, have you gotten your supplies yet? Do you even know where they are sold locally? Right now where I live, the garden center is quickly filling up with all sorts of garden things and no one even goes through the section because gardening isn't on anyone's mind when they are still trying to remember if they banked the wood stove. If you want to be ahead of the garden game this year, you have to be ready. Here are my top 5 reasons to start your herb garden as soon as possible. Easter kicks off the early garden supplies at all the big box stores. You aren't buying specialty items at these places, but the basics like pots, seeds, tools, markers, labels, trays, seed starting soilless mixes and more, are just begging you to take a look. If you are ordering online or from a magazine, it pays to order early. These herbal suppliers only have a finite number of plugs or seed packets to sell. If you wait much past February (January for some specialty items), you won't be able to get anything! Don't make the mistake of putting it off until you actually need the items. By then, it will be too late. Early in the pre-season is also when you can ask for specific items you need to be ordered. Make friends with your neighborhood garden center employees and you will have your specific items set aside and waiting for you when you check out. You can also ask when items will be delivered to the store, and inventory will be refreshed. It's a great way to "meet the truck" and get your things before everyone else knows about them. The first pick is always the sweetest. Very early in the season is when the promotional material is out to catch the consumer's eye. You can find awesome deals on heat mats, multipack cell trays, watering cans and many more things. These items are usually found prominently displayed and on endcaps. If you shop early, you can have your choice of selection. Many of these items are not reordered, so when they are gone, they are gone. Early growing means your herbs have a fighting chance in the optimal growing weather before they have to struggle to make it in the fickle outside garden. Strong plants mean they can take more stress when they are transplanted too. Why not give them a couple of extra weeks before placing them outside. Grow extra herbs and give them time to prove which ones are going to be the healthiest. If you can thin ruthlessly, you will have optimal time to pick just the best of the best and plant what is growing well under your specific care. If you are growing herbs that have the potential to fail; finicky or fragile types, for instance, give them plenty of time to do their thing. Some herbs take forever to germinate, you will benefit from extra weeks growing time for those too. It just makes sense, right? This may seem a little depressing, but give your herbs time to fail. That's right, some expectation of failure built into your garden season removes some of the stress of trying to get everything up and growing. Some herbs just naturally are hard to grow. It doesn't matter if it's your first year gardening or your 50th. You will make mistakes, your seeds won't grow, your herbs will shrivel and die sometimes. If you only have a short season like I do, building up the length by starting early gives me time to allow my more precious crops to get going and even die off. I don't worry because it's still early enough in my short season to grow it again. Gardeners can be fickle too! How many times do you buy on impulse (it's ok to admit it) and then get your plants home and realize that you are never going to eat one leaf of that lemon basil? Of course, you can still plant it to keep it from being wasted, or you can pot it up and gift it to a friend who loves lemon basil, still having time to plant something in its place. Smart thinking, right? Also, once you start growing your herbs, you may find that they need more care than your schedule will allow. If that's the case, and you plant early, then you can get rid of the fussy herbs and replace them with herbs more suited to your style and garden area. It's good to have time for reflection. Building in extra weeks of garden time gives you, the gardener, more time to see if your garden schedule is going to work for you. Of course, like baby anything, it's much more labor dependent when the plants are small and need to be tweaked just right. Start your garden notebook right away and take plenty of notes about watering, lighting, what sort of trays and soil you use, what kind of fertilizer you used and how often you used it, anything that you do to your early herbs should be written down. That way, you can remember properly and either repeat those steps or change things up again for the next time. I have often started too many seeds and after potting into larger pots a couple of times, realized that my basil is growing better than it ever has before and started feeling overrun. That's when I harvest to the bottom of the stem and just leave a few plants growing. It makes me feel much less overwhelmed. Without the stress of heat and bugs, you can fall in love with the idea of gardening and will actually start to look forward to getting outside in whatever fashion you will be bringing your herb. Watch how the rain pools in your future gardens. See if you can design the best place for your plants by observing what empty garden space you do have. Now is the time to fuss and change things around. Although not impossible, it's much more difficult to rearrange herbs once they are tucked into the ground for the season. Get out into the empty garden and if it's not too mucky, weed the excessive vegetation (if there is any) and clear any winter debris that may have blown into your garden beds. Fix the rock walls and add fresh organic material if the ground isn't too frozen. You have to be careful not to insulate the frozen ground from thawing, but tidying up and grooming your garden beds is always useful for finding weaknesses. I have found broken garden rock walls, leaking beds, rodents who have set up homes in my raised beds, warped bed walls, ripped row covers and missing hoops, before ever planting a seed. I would rather fix those problems before the plants were waiting to go in. 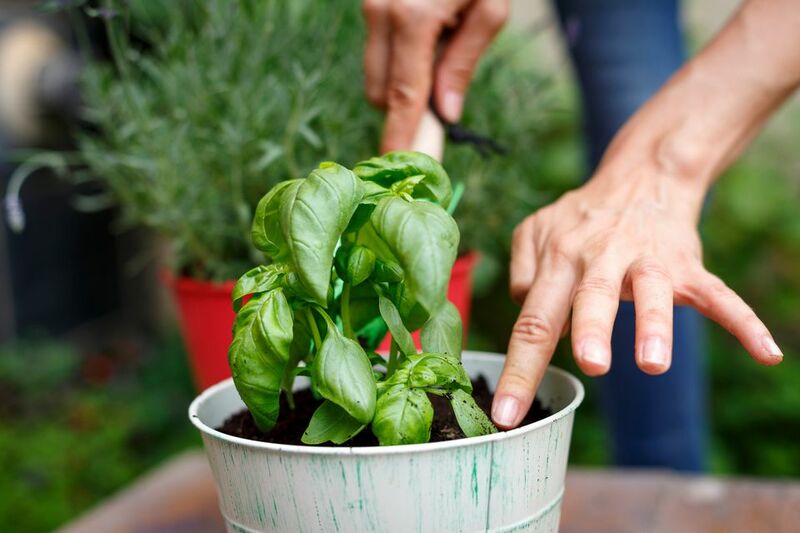 To start as early as possible, take a look at two things; The packets of seeds and plant labels that suggest when to transplant your herbs outside, AND ask your neighbors when they always plant their gardens. Even though we all have designated zones, we also have micro-climates that only apply to our direct area, sometimes in our own yards alone. By asking around, you can get a much more accurate estimate about last frost dates right where you are. The packets and labels are still important, but not always as accurate for your garden specific area. I count back the number of weeks necessary until the last frost date and suggested a date of transplanting, and mark my calendar. Then, I start many of my herbs in seed trays at least two weeks before that. Of course, I have greenhouses, but even someone growing in a sunny location can do the same. You have to watch for signs that your herbs aren't getting enough light, like legginess and paleness, but a close monitoring will keep those things in check. Transplant into larger pots as needed and don't forget you still need to harden off before placing directly in the open sunlight when going outside. There is a definite outdoor garden season–you do have to stick pretty close to what Mother Nature gives us. But by starting early, you can build in some breathing room for yourself and not feel the pressure to grow a successful garden from day one. We all have our ups and downs each season, why add that sort of guilt to the mix?